This book is not a comparative exercise per se. The guidelines presented in the Introduction were shared and discussed with all of the contributors; however, ultimately, each of them was free to put the emphasis on certain aspects of the theoretical framework so as to best reflect the specificities of their respective cases. Not all of the points mentioned (e.g. compliance with the Paris Declaration, the role of ideas, etc.) 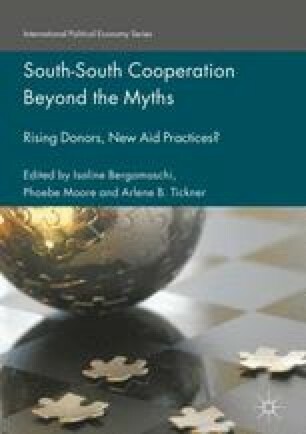 are relevant to all the South–South cooperation (SSC) providers covered in the book. The editors were anxious to let authors focus on what is most relevant in the case at hand and to let research questions emerge from observations of the cases and fieldwork rather than from a common list of imposed problématiques defined ex ante. The authors thank Carlos Soto Iguarán (Universidad Externado, Colombia) for his assistance in designing the typologies included in this Conclusion and Arlene B. Tickner, Danilo Marcondes, Pooja Jain, and Daniele Benzi for their comments on previous drafts of it. APC-Colombia. 2015. Hoja de Ruta de la Cooperación Internacional 2015–2018. Bogota. https://www.apccolombia.gov.co/index.php?idcategoria=2362. Accessed 1 Mar 2016.